Range: Groundhogs are widely distributed in North America and are particularly common in the east where they are found from Alabama and Georgia in the United States to northern Quebec and Ontario. In the west, their range extends northward to Alaska and through southern Yukon and Northwest Territories. Groundhog distribution is spotty everywhere on the edges of the range. 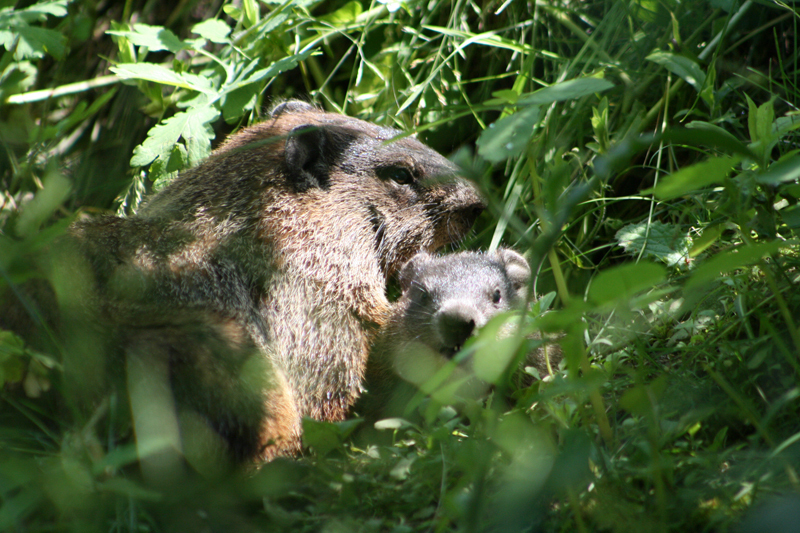 Habitat: Groundhogs prefer open areas such as fields, clearings, open forests, and rocky slopes. They generally dig their burrows in areas where luxuriant grasses and other short-growing plants provide food. They tend to avoid damp or swampy areas. Summer burrows are often in the middle of pastures and meadows, and the animals will have a denning burrow, used only in the winter, in woody or brushy areas nearby. Winter burrows, whether separate or part of a woodchuck family’s main burrow system, are usually deep enough to be located below the frost level. Diet: Groundhogs prefer to eat fresh green vegetation. They eat a wide variety of wild plants, clover and alfalfa, and garden vegetables if they can get them. On rare occasions, they eat snails, insects, or young birds that they come upon by accident. Early in spring they eat bark and small branches. Young woodchucks are born in April and May (in Canada, mainly in May) following a gestation, or pregnancy, period of 30 days. One litter, usually with four young, is produced per year. Woodchucks are blind and helpless at birth, about 10 cm in length and about 30 g in weight. At about 28 days old, their eyes are open, and they are covered with short hair. They are weaned, or have made the transition from mother’s milk to solid foods, when they start to emerge from the burrow at five to six weeks of age. Woodchucks grow rapidly. They weigh 570 g at eight weeks of age and become very fat for hibernation. Woodchucks have been known to live for 10 years, although the average life span is probably much less. Regardless of whether Wiarton Willie, Punxsutawney Phil, Brandon Bob, Balzac Billy, Shubenacadie Sam or Gary the Groundhog saw his shadow on Groundhog Day, the first groundhog I see after a long winter is a sure sign of spring. Also called woodchucks and whistle-pigs, groundhogs are rodents that are found in southern Canada, even through southern Yukon and Northwest Territories. Stocky in appearance, groundhogs weigh on average between two and four kilograms (4.4 and 8.8 pounds) and measure between 40 and 65 centimetres (15.7 and 25.5 inches) in length, which includes their 15-centimetre (5.9-inch) bushy tail. Excellent burrowers, groundhogs are equipped with strong legs and claws. They are usually basic brown, but they can also be yellowish to reddish brown. Mating occurs once groundhogs emerge from hibernation, and after a period of about 30 days an average of four young are born, typically in May. Females have just one litter a year. Born blind, helpless and weighing only about 30 grams, they are weaned and eating nutritious plants within six short weeks. Primarily herbivores, groundhogs enjoy munching on fresh green plants, including grasses and forbs, clover, alfalfa and garden vegetables. Very rarely they have been observed feeding on insects, snails and even young birds. Their burrows are quite elaborate, with a main entrance, at least one “spyhole,” a nesting area and a separate toilet chamber. Groundhogs are known to keep their burrows clean by lining the bottom with dry grass. Groundhogs are true hibernators; they enter hibernation in either late September or October and don’t emerge until March. While hibernating, groundhogs reduce their heartbeat from approximately 80 to five beats per minute and can reduce their body temperature to as low as 3°C. Groundhogs spend a lot of time eating and warming themselves in the sun. They are able to climb trees, though they prefer spending their time on the ground. They typically don’t stray too far from their burrow, making sure they can scurry to safety in the event of an oncoming predator such as a red fox, coyote or dog. Groundhogs are known to be quite vocal, which is where their other common name, whistle-pig, comes from. Their range of noises includes a loud whistle, when they are alarmed, a squeal, when they are fighting or injured, and tooth grinding, when they are cornered. They are also known to bark, but their reason for making this sound is unknown. Groundhogs can live in the wild for up to six years. The burrows they create and eventually abandon become shelters for numerous species, including foxes, rabbits, skunks, raccoons and snakes. Groundhogs are also important prey for animals such as bobcats, bears and wolves. 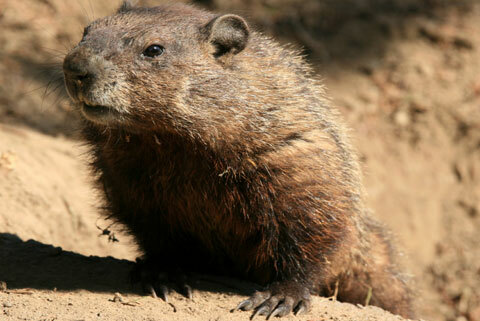 Groundhogs can wreak havoc in gardens as they munch away on scrumptious flowers and vegetables. There are actions you can take, however, to save your beautiful garden. Try sprinkling some scent and taste deterrents, such as lemon juice, talcum powder (mixed with water), garlic powder, onion powder and dog hair in nylon stockings on sticks in and around your garden. The more of these you use and the more frequently you apply them, the sooner the groundhog will learn that visiting your garden is not a very safe or tasteful experience! 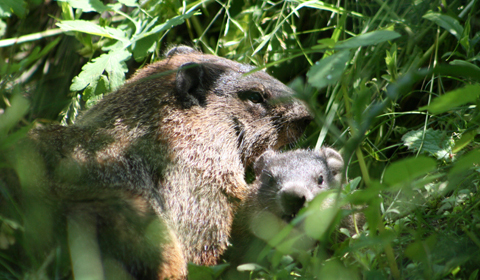 As groundhogs help to keep your weeds in balance, make sure you don’t use any herbicides and provide rocks in safe, sunny areas near their burrows where they can sun themselves when they’re not eating. Hopefully this spring your garden won’t act as a smorgasbord for these stocky rodents, and you can enjoy their antics as they soak up the sun in your backyard!